Text and Tell is now live! The posters are up and the service is now live! 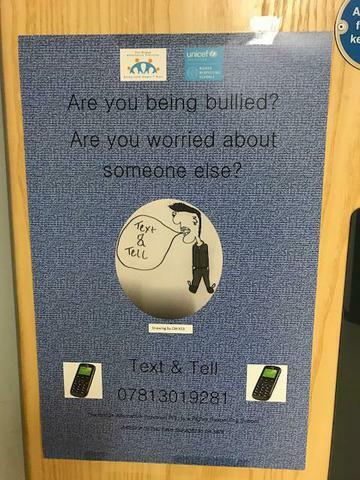 Text and Tell was launched during Anti-Bullying week and KS3 designed this name and the logo for the posters which are now all over the Bridge. 90% of pupils agreeing that if bullying or harassment occurs staff deal with it. However, from time to time everyone needs someone to "talk" to or to share a worry with, either about themselves or a friend. Pupils can text the hotline in confidence and a senior member of staff will respond appropriately, also in confidence. We also have a worry box on the corridor and all staff are available to support pupils during the day, especially at break and lunchtimes.